It's all about celebrating freedom...and cool stuff, obviously. The Fourth of July is right around the corner, and if you're planning some get-togethers, cookouts, and other fun stuff with your family, make sure you save some time to get in a little GTA Online. From the sound of things with the latest content update, it's gonna be pretty lit. 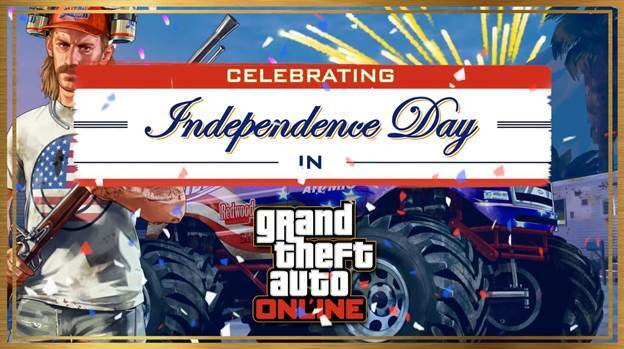 There's a ton of Independence Day-themed content up for grabs in GTA Online this year, like fireworks, firework launchers, patriot tires, parachute smoke, MK II weapon liveries, and tons of other items to help you celebrate the ol' red, white, and blue. If you ended up signing up for the special Guest List last week, then you should also have access to a round of exclusive rewards that include an Orange Wireframe Bodysuit, and GTA$300,000. If you log in between July 10 and July 16, you'll also get a Pink Wireframe Bodysuit and an additional $100,000. If that's not enough, you can take 40% off tons of goodies, including the Vapid Liberator, a musket, Stars 'n Stripes Facepaint, and a selection of other items so you don't have to spend much money on living it up for the 4th. Sound like fun? Make sure you don't skip out on Independence Day with one of the zaniest and weirdest online multiplayer titles around, because that would totally be a bad idea.